This page contains a list of all past ABD London Newsletters which you can download as a pdf document by clicking on the Issue Number (except older ones). If you cannot find something, use the Site-Search function. To register to receive a free copy of our newsletters via email when they are issued, go here: Register . The newsletter is published approximately bi-monthly. Issue No. 67 (Apr 2019) ULEZ News, Mayor's Dubious Gesture and Taxi Age Consultation, Sadiq Khan Refuses to Answer Questions, Mayor Lies, Mayor Loses High Court Case over CS11, Legal Action Against Mayor by Minicab Drivers, Cab Driver Protests Escalating, London Air Pollution Alert, Wood Burning Stoves, Permit Parking Charges Hiked in Camden, Higher Permit Parking Charges in Croydon, Kingston and Lewisham, East Dulwich Permit Parking Scheme, Tony Frew Obituary, Richmond Ignores 20 Mph Vote and Wandsworth's Doubtful Claims, 20s Plenty Debunked, Dockless Bike Hire Schemes, Idris Francis Obituary, Mandatory Speed Limiters (ISA), The Most Congested Roads in the UK, Bus Accidents Kill Too Many People, City of London Corporation Ignores Representations, Media Coverage. Issue No. 66 (Feb 2019) London Travel Trends, TfL Business Plan, Profits from the ULEZ, Air Pollution Crisis, Life Expectancy Data, More Tax Raising, Motorists Fuming and Healthrow Expansion, Air Pollution Underground, Borough Speed Limit Enforcement, UnBlock Meeting, Crossrail, How TfL Wastes Money, Demonstrations Blocking Roads, Cyclist Behaviour, MTS Campaign Update. Issue No. 65 (Dec 2018) No Road Safety Benefit from 20 Limit, Borough LIPs, Lewisham LIP, Lambeth LIP, Bromley LIP, City of London Corporation Transport Strategy, Unblock the Enbankment, Political Protest Blocks Traffic, Sadiq Khan Exploiting Children, Fight Against Unfair Fines, Money Generation by Councils, Are 20 MPH Campaigners Killing People?, High Public Transport Use in London, Bus Lanes on TalkRadio, New Lower Thames Crossing. Issue No. 63 (Aug 2018) 20 Mph Speed Limits on Major Roads, 30 Mph Limit on A40, No Benefit from 20 Mph Speed Limits, How to Travel Safely, Degrading the Road Network in the City, Bus Jam Near Bank, Changes to Congestion Charge, The Cost of Khan, London Airport Court Case, £50 to Drive to Westminster and Cycle Superhighway Challenge, Environment Strategy Misses the Point, Mayor Pushes Ahead with ULEZ Expansion, Do Low Levels of Air Pollution Damage Your Heart?, Stopping the School Run by Closing Roads, Mayor's Transport Strategy Letters. Issue No. 62 (Jun 2018) Cycle Superhighways Brought in Too Quickly, Speed Limits in London to Be Reduced, Ken Livingstone Quits, City Corporation Meetings, Heidi Alexander Appointed Deputy Mayor for Transport, Opposition to Oxford Street Changes, MTS Campaign Meeting Report, Too Much Parking Says Mayor, How the Mayor Spends Your Money, Silvertown Tunnel Gets Go-Head, Smart Motorways Not So Smart, Urban Vehicle Emissions, London Airport Expansion, Bank Junction Closure, No Benefit From Speed Awareness Courses, London Environment Strategy. Issue No. 61 (Apr 2018) TfL To Lose £1 Billion Per Year, The Real Profits from the ULEZ, Mayor Sadiq Khan Ignores Objections, Traffic Speeds in London Are Getting Worse, Cycle Superhighways Consultation Results Biased by Cyclists, Richmond 20 MPH Limits, Enormous Numbers of Fines at the Dartford Crossing, South London Road Network, Silvertown Tunnel, Emirates Cable Car, Bike Hire and TfL Finances, Opposition to London Plan on Parking, Road Reopening and Closures, Meeting Against the Mayor's Transport Strategy, City of London Transport Strategy. Issue No. 60 (Feb 2018) The ULEZ - It's About Money, Air Pollution and Asthma, The London Plan - ABD Comments, Street Lights, Charging Points and Taxis, TfL Business Plan - Mayor Khan Wants More Money, More Money for Cycling, London is Pampered while Mayor Whinges About Money, London Plan Meeting, Mayor's Transport Strategy Feedback, City of London Wants Your Views, Sadiq Khan Decides PCNs Will Increase. Issue No. 59 (Dec 2017) Mayor's Transport Strategy-Campaign Report, Disabled and the MTS, Panic on the Streets (ULEZ Proposals), Does Air Pollution Cause Asthma?, Mayor Pushes Ahead With ULEZ, The London Plan, National and London Infrastructure - Both Deporable, Killing the Private Hire Industry, Cycle Superhighways and Motorbikes, New Thames River Crossing, Silvertown Tunnel, Oxford Street Pedestrianisation, M25.A3 Wisley Junction, Bank Junction Closure, City Traffic Reduction. Issue No. 57 (Aug 2017) Mayor's Transport Strategy (MTS), Forcing Implementation of the MTS, Transport Costs in London, New Web Site, Barriers on London Bridges, Most Drivers Ignore 20 MPH Speed Limits, 20 MPH Zone Impact on Traffic Speed, Media Coverage of Air Pollution, The Social Costs of Air Pollution, Diesel and Petrol Car Demonisation, H&F Air Quality Consultation, Follow Us On Twitter, A Plague of Bikes, Departure from the AA, Lambeth Bridge and Waterloo Changes. Issue No. 56 (Jun 2017) London and the Party Manifestos, Air Pollution and the ULEZ, UK Air Quality Plan, Air Pollution - Oxford Street Buses and Nanoparticles, Bank Junction Closed To Traffic, The Rise of Non-Travel, Reader's Letter, Permit Parking Charges in Lambeth, Survey Results, Croydon 20 - Pushing Ahead Regardless, 20MPH in Bath, 20MPH in the City. Issue No. 55 (Apr 2017) Mayor's Latest Proposals for ULEZ, UK Air Pollution - The Facts, Diesel Vehicle Petition, Speed Humps to Slow Cyclists, Thames Crossing, Publicity For Traffic Management Proposals, 20 Mph Makes Very Little Difference, Or 20 Mph Makes Matters Worse. Issue No. 54 (Feb 2017) Air Pollution and the ULEZ, Diesel Parking Charges, More Cyclists and More Delays, Cycle Superhighway 11 Goes Ahead But Another Halted, TfL Business Plan: Enormous Bus Subsidies Still Rising, Solutions to Traffic Congestion, Bank Junction Closure, Croydon Proceeds with 20 Mph Zones. Issue No. 53 (Dec 2016) Second Consultation on ULEZ, Diesel Permit Parking Surcharge in Merton, Heathrow Airport and Environmental Pollution, Mayor Calls for Congestion Charge on VW, Traffic in the City of London and Beech Street, Banker Fined for Dangerous Cycling, The Garden Bridge - Surely a Vanity Project, TfL's Damaging Proposals for Cycle Superhighway 11, ABD Comments on HS2. Issue No. 52 (Oct 2016) GLA Scrutinise Traffic Congestion in London, Mayor Supports More River Crossings, Tower Bridge and Shorter Street Closures, Cable Street Road Closures, Transgender Traffic Lights, Profits From Yellow Box Junctions, Speed Awareness Courses and Police Waivers, Community Roadwatch and Speed Awareness Courses, Safer Lorries to Help Cyclists and Pedestrians, Richard Branson Survives Speed Hump Collision. Issue No. 51 (Jul 2016) Ultra Low Emission Zone (ULEZ), New Mayor's First Acts, New Mayor's Broken Promise, Old Mayor's Advice Ignored, Speed Humps and Air Pollution, Cycling and Walking Strategy, Opposition to Cycle Superhighway 11, Bristol Mayor, ABD Launches Campaign Against Speed Awareness Courses, Shorter Street Closure, Miscellanours News, Congestion Taxes Unpaid. Issue No. 50 (May 2016) London Mayor Transport Policies, 20Mph in Croydon, Croydon Pushes Ahead with 20 Mph in Zone 2, Cyclists Racing on London Streets, London Divided and Cycling Accident Rates, Janet-Street Porter's Views on the Cycle Superhighways, Shorter Street Closed, Traffic Congestion Increased, Council Transport Policies Driven by Opinion, Miscellaneous News: RideLondon, ULEZ, Bus Usage in London, 20Mph Enforcement in the City. Issue No. 49 (Mar 2016) Travel in London - It's Changing, Mayor's Transport Budget, Backlash Against 20mph in Hammersmith & Fulham, More Congestion in the City, Are Cyclists Racing on London's Streets, HGVs and Cycle Safety, The Latest Accident on Chislehurst Commons, Accident Statistics - An Inconvenient Truth, Cycle Superhighway on the A40 Westway, Castles in the Air or Tunnels Under London?, Cars to be Included in the LEZ?, ABD Press Release on Speed Cameras, Quietways Consultations. Issue No. 48 (Dec 2015) Boris More Damaging than the Blitz, Euston Road to be Degraded, Police Forces Bending the Rules for Profit, Prolific Speed Cameras, Gallions Reach and Belvedre River Crossings, Westminster Bridge, Vauxhall Cross and Wansworth Town Centre Changes, Croydon 20 Mph, Ealing 20 Mph, Croydon Raking it in from Video Cameras, Bank Junction to be Closed?, Lambeth Reopens Loughborough Road Junction, Follow the Blog, Uber Wins Judicial Review, Learning from Mistakes, Councils Profit from Parking, Hammersmith & Fulham 20 Mph. Issue No. 47 (Oct 2015) City of London 20mph - First Results, Blackwall Tunnel Consultation, Lambeth 20mph, Road Closures in Lambeth, And Road Closures in Hackney, Parking Cameras in Bromley, Bus Passes for the Homeless, Luddite Black Cab Drivers, Road Casualties in London, Parking Fines in London, Air Pollution from Vehicles. Issue No. 46 (Aug 2015) Croydon 20mph Consultation Results Rigged, London Leads Europe on Congestion, Challenge to Embankment Superhighway, Vehicle Duties and Other Budget Changes, Islington 20 Mph Everywhere, Hammersmith & Fulham 20 Mph, Croydon Closure of Norbury Avenue, Street Lighting, Billionaire Speaks Out, Air Pollution. Issue No. 45 (May 2015) Croydon 20mph Consultation, 20mph Speed Limits, Large Numbers of Dartford Crossing Penalty Charges, East London River Crossings, Car Turntables, Parking Regulation Changes, Greens Lose Brighton, Minicabs and Rickshaw Under Attack, The Size of TfL, It Pays to Challenge PCNs. Issue No. 44 (Feb 2015) Go-Ahead for East-West and Other Cycle Superhighways, How Much is "Ambience" Worth?, More Speed Cameras Everywhere, Chelsea Bridge to Embankment - A New Kind of Junction, Increasing Journey Times: London Wall and Bow Roundabouts, 20 Mph Enforcement, London Boroughs to Target Diesel Cars, Increased Parking Charges. Issue No. 43 (Jan 2015) New ABD Blog, East-West Cycle Superhighway and Transparency Consultation, Removing Bus Lanes in Liverpool and London, More Speed Cameras and More Fines, Dartford Crossing Fines, Barnet Emissions Based Permit Parking, Stockwell Gyratory. Issue No. 42 (Nov 2014) Silvertown Tunnel Consultation, East-West Cycle Superhighway, Vauxhall Cross Redesign, 20 Mph Schemes, Ultra Low Emission Zone Consultation, Miscellaneous News: Maximum parking standards, Dartford Crossing Free-Flow and new fees, Barclays Cycle Hire economics, New car park at Chislehurst Station, Giving way for emergency vehicles. Issue No. 41 (Oct 2014) East-West Cycle Superhighway, Superhighways and Super Sewers, North-South Cycle Superhighway, Croydon aims for blanket 20mph limits, Air Quality, Parking Camera Enforcement. Note: Newsletters older than this are not stored on our web site but can be supplied upon request. The contents are given below. Issue No. 40 (Jul 2014). Tottenham Court Road Proposals, Chislehurst Commons Roads, Consultation on Parking, Mayor Ignores Opposition to Congestion Charge Tax Rise, Public Consultation on Cycle Safety. Issue No. 39 (May 2014). Roads Task Force Progress Report and Ultra Low Emission Zone (ULEZ), Congestion Tax to Rise, Traffic Spies. Issue No. 38 (Jan 2014). Local Authority Parking Consultation, Changing a Borough's Parking Policies, Cycling in London, Flashing Cycle Lights, Aldgate Gyratory Redesign, Deaths on the Roads, Thames River Crossings, More Average Speed Cameras, Wide Area 20 Mph Speed Limits. Issue No. 37 (Sep 2013). A14 Tolling, HS2, Surveillance Camera Code of Practice, Roads Task Force, RideLondon Event, Surrey Cycling Strategy. Issue No. 36 (Jul 2013). Barnet Parking Charges Defeated, Rotherhithe Tunnel, New Car Park at Chislehurst, London Thames River Crossings, Dartford (Lower Thames Crossings), Roads Task Force. Issue No. 35 (Mar 2013). Chaos at Rotherhithe Tunnel, Cycling Revolution in London?, Traffic Speeds Will Fall, UKIP Anti-Tolls Campaign, Traffic News & Web Cams Site, Boris Johnson's "Game Changer", Complaints About Rail Fares, Speed Awareness Courses and Speed Summit. Issue No. 34 (Jan 2013). New Thames River Crossings, Dartford Crossing Free-Flow Charging, Location of New Average Speed Cameras Confirmed, New Bridge Opened in Bromley, Flying to Excel via Cable Car, Drive Recorders, Speed Camera Effectiveness - the Latest Research, Which Road Ahead? Road Privatisation. Issue No. 33 (Nov 2012). New Thames Rover Crossing, Old Thames River Crossing, 20mph Speed Limits, Pedestrian Fatalities in London, Speed Humps and Spinal Fractures, London Road Safety Action Plan, Distorted Road Safety Budgets, More Speed Cameras in London, Speed Camera Count, Roads Task Force Consultation, Lambeth Speed Humps, Road User Charging by the Back Door? Issue No. 32 (Aug 2012). The London Olympics, Boris Beats Ken, 20-Mph Zones, Eden Park CPZ Canned, Parking Report from the RAC. Issue No. 31 (Apr 2012). Boris versus Ken Debate Continues, Exhibition Road Shared Space Scheme, Speed Humps Successfully Challenged, Bromley News, CCTV Camera Cars, Buses Blamed for Poor Air Quality, Minicabs in Bus Lanes, Brian Coleman to be Ejected? Speed Camera Count. Issue No. 30 (Feb 2012). Perverting Justice, Thames Valley Speed Cameras, East London River Crossings, Defeat in Barnet, Victory in Westminster, Local Consultations, Johnson versus Livingstone Again, Speed Camera Count. Issue No. 29 (Dec 2011). Parking & Judicial Reviews, Coming to a Bus Stop Near You?, Speed Humps May Be Illegal, Parking and Camera Enforcement, Boris Island Takes Off, Transport Spending, Dartford Crossing, Speed Camera Count, Perverting Justice. Issue No. 28 (Oct 2011). Speed Hump Petition, Other Petitions, Localism Bill, Speed Camera Count in London, Perverting Justice, Why Trams Belong in Museums, Managed Motorways, Railway Bridge Closure, TfL Surplus Staff, Speed Limit Changes, Accident Information. Issue No. 27 (Aug 2011). Dartford Crossing Tolls Rise, Transport Expenditure, Improving Happiness, Blackfriars Bridge, Perverting Justice?, The Future of Road Congestion in London. Issue No. 26 (Jun 2011). Barnet CPZ Legal Action, ABD Members Meeting, No Net Revenue from Congestion Tax, Cycle Hire Scheme, Harassed by Schoolchildren?, Blackfriars Bridge, Rotherhithe Tunnel 20 Mph Cameras. Issue No. 25 (Apr 2011). Perverting Justice, Electronic Petitions, Camera Enforcement of Parking, High Speed Rail (HS2), Blackfriars Bridge, TSUG News, TfL Business Plan. Issue No. 24 (Feb 2011). Revised London Penalty Charges, TfL Traffic Offence Profits, Richmond Parking, Congestion Tax is a Tax, 20 Mph Speed Cameras - the Facts, Surveillance by Cameras, RAC Foundation Report, Speed Cameras on the A13, Local Implementation Plans, No Warrants, Drivers Charter in H&F. Issue No. 23 (Jan 2011). No 20 Cameras Campaign, Do Average Speed Cameras Work?, Profiting from Parking, It Pays to Appeal, TfL Traffic Offence Profits, A Wheeze by Westminster, DfT Business Plan. Issue No. 22 (Dec 2010). 20 Mph Zones in Portsmouth, Removing Traffic Lights, Profiting from Parking, CCTV Parking Enforcement, Congestion Charge Changes, Travel in London, Government Spending Review. Issue No. 21 (Oct 2010). Parking Fines, Bromley's Parking Revenue, Permit Parking Schemes, Olympic Route Network, Cycle Hire Scheme, Road Works & Road Sense, Mayor's Business Plan, Livingstone's Transport Policies, E-Petitions, Dartford Crossing & the M25, Motor City - Hither Green, Local Government Ombudsman, Speed Display Devices v. Cameras. Issue No. 20 (Aug 2010). Cycle Superhighways, Pie in the Sky?, Richmond Parking Charges, Air Quality Strategy, Scrapping Traffic Lights, Kulveer Ranger and Cycling, Your Freedom, Motorcycles in Bus Lanes, Road Tolls in Outer London, Greenwich Town Centre, Councils Duty to Road Users, London Accident Statistics, Parking Charges in London, Congestion Charge Consultation. Issue No. 19 (Jun 2010). General Election Impact, Richmond Election Result, Air Quality Consultation, Congestion Charge Consultation, Mayor's Transport Strategy, London Borough Briefing. Issue No. 18 (Apr 2010). Mayor's Air Quality Strategy, Blackwall Tunnel Improvements, Drivers Alliance & Election, How London Boroughs Work, Parking in Croydon. Issue No. 17 (Feb 2010). Mayor's Transport Strategy, Climate Change Strategy and FOI, Budget Cuts, West End Parking, Oxford Circus Pedestrian Crossing, Useful Data and Traffic Flows, Electric Cabs, Greenwich Town Centre, 20-Mph Zones, Labour's Transport Policies. Issue No. 16 (Dec 2009). Mayor's Transport Strategy, Brian Mooney's Comments, Cycle Superhighways & Hire Scheme, Congestion Tax Changes, Roadworks Permit Scheme, Speed Cameras. Issue No. 14 (Jun 2009). Electric Cars Plugged in London, Every Breath You Take, 20 Mph Too Low?, The Causes of Accidents, Mayor's Transport Strategy, Does Policing Reduce Accidents?, Travel Plans, Coulsdon Parking Proposals. Issue No. 13 (Apr 2009). Contentious Shared Space, Memorial Flowers, Specs 3 Cameras, Letters (Aldgate Scheme). Issue No. 12 (Dec 2008). Congestion Charge to be Abolished, 20 Mph Speed Limits, Speed Humps - London News, SIDs Do Work, Environmental Debate, Not Guilty, But You'll Still Pay, Boris's Way to Go, Mayor's Recent Decisions, LIP Funding & Distorted Priorities, New "Routemaster" Winners, The Olympic Route Network. Issue No. 11 (Sep 2008). London Congestion Tax, Western Extension Consultation, Wide Area 20Mph Speed Limits, Pedestrianisation of Parliament Square. Issue No. 10 (Jul 2008). Johnson Announces Congestion Charge Consultation, New Routemaster Competition, £25 Congestion Charge Scrapped, Speed Table Noise & Vibration, Child Car Safety Seats, New Policies at TfL?, Bus Lanes, Cycling and Road Safety, When Traffic Offences are Void, Speed Humps & The Disabled, Mobile Phone Parking, Speed Cameras. Issue No. 9 (May 2008). Election Results, TfL and the Ipsos/Mori Survey, No Privacy in London, Dartford Crossing Tolls, Road Works to be Controlled?, Debate on Road Pricing, Traffic Counts Not Rising. Issue No. 8 (Mar 2008). Mayoral Candidate Policies, Petition Against Speed Humps in Chislehurst, A Personal Story of Speed Camera Persecution, Croydon Tramlink Takeover by TfL, "Driving Change" Seminar, £25 Congestion Charge Challenge, Motorbikes in Bus Lanes, Harrassment by Bailiffs. Issue No. 7 (Jan 2008). Parliament Square to be "Improved", Speed Humps Double Emissions, Green Party Coerces Livingstone, The Mayoral Elections, Living Under Livingstone, Traffic Calming in Tower Hamlets, London Travel Report 2007, £25 Congestion Charge, Road Accidents: Prevent or Punish? Issue No. 6 (Nov 2007). Lycra Louts and Cycle Stop Lines, Road Deaths in London Rise, Third World Country Subsidises London Bus Fares, New ABD London Region Web Site, Living Under Livingstone, Overwhelming Opposition to Greenwich Road Tolls, 20 Mph Speed Limits, More Anti-Car Plans, Capita and the Congestion Charge, How to Collect Cash from the Public. Issue No. 5 (Sep 2007). Cars and Air Pollution - The Facts, Manchester Congestion Tax, TfL, FOI and the Blackwall Tunnel, ABD Launches Campaign Against the Greenwich Congestion Charge, Proposed £25 Congestion Charge, Higher Penalties for Congestion Charge Infringers, Response to Hump Petition, London Van Guide, Richmond Persecution Continues, Thames Gateway Bridge - A Victory for the Luddites?, West London Tram is Dead, The Four Hills Speed Hump Study. Issue No. 4 (Jul 2007). Greenwich Road Tolls and Blackwall Tunnel Tidal Flow, Road Pricing - the Key Issues, Transport 2000 Funding, London LEZ, Bus Jams, Tramlink Extension Consultation, The Dangers of Bendy Buses, Ealing Traffic Calming Update, The Cost of London's Freedom Pass, Challenging Ken Livingstone on Congestion Charging & Pollution, IPSOS/MORI Conference Report, Unreasonable Camera Enforcement in Lambeth, Another London Mayoral Candidate, Speed Humps in Leyton. Issue No. 3 (May 2007). Toronto Rejects Congestion Charging, Greenwich Road Tolls, Tidal Flow in Blackwall Tunnel Ended, Bromley Council Opposes Road Pricing, New London Parking Service, Black Cabs in Mourning?, Community Speed Watch, Speeding Fines - A Lottery for Honest Drivers, Parking Permit Votes in Islington, A New Threat to Your Freedom. Issue No. 2 (Mar 2007). Petitions Against Road Pricing and Speed Humps, London's Low Emission Zone, Richmond Permit Parking Campaign, Ealing Campaign, Croydon Tramlink, Tramlink and Bus Competition, Cross River Tram, New Draconian Powers in TfL Bill, Mayoral Candidate Steps Forward, Orpington Bus Lane Cameras, Bromley Road Safety Plan, Dartford Crossing Consultation, Congestion Charge Extension. Issue No. 1 (Jan 2007). Inaugural Meeting of London Members, Croydon Tramlink Extension, More Red Lights and Slower Traffic Speeds, Orpington Bus Lane Cameras, Dartford Crossing Toll Changes, Richmond Permit Parking Scheme, New London Traffic Web Site, LEZ Consultation, The Latest Attack on Car Owners, Figures Demonstrate Road Safety Policy is Wrong, The Eddington Report, Conservatives "Getting Around", Greenwich the Next Area for Congestion Tax in London?, Sign a Petition Against Road Tolls. BBRAG Newsletters (1999-2009). 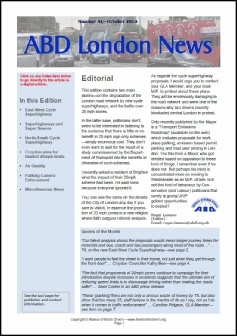 Note that before the ABD London newsletters were produced, there was a newsletter issued by the Bromley Borough Roads Action Group (BBRAG) which covered many of the same issues. These go back as far as 1999. The BBRAG web site is now archived, but this document contains a list of the newsletter contents which are still available upon request: BBRAG-Newsletters. Note: links to web pages in some older newsletters may only work on desktop devices. Use copy and paste into your web browser instead in that case to open the link.